/>Aiki jujitsu is practical martial arts, as opposed to sports like Judo or Brazilian Jujitsu (a form of Judo), Karate or wellness exercises like tai chi. Aiki jujitsu is an elaboration of combat techniques implemented most aggressively in what originated as a samurai’s last resort; they were applied to dismember, and dispatch their opponent. The origins of Daitō-ryū maintain a lineage extending approximately 900 years, originated by Minamoto no Yoshimitsu (1045 – 1127). Yoshimitsu’s great-grandson Nobuyoshi adopted the surname “Takeda”, which has been the name of the family to the present day.first became widely known in the early 20th century under the headmastership of Takeda Sōkaku. Takeda had extensive training in several martial arts (including Kashima Shinden Jikishinkage-ryū and sumo) and referred to the style he taught as “Daitō-ryū” (literally, “Great Eastern School”). Although the school’s traditions claim to extend back centuries in Japanese history there are no known extant records regarding the ryū before Takeda. Whether Takeda is regarded as either the restorer or the founder of the art, the known history of Daitō-ryū begins with him. Takeda’s best-known student was Morihei Ueshiba, the founder of Aikido. Serving North San Diego County and East San Diego County for over 20 years. 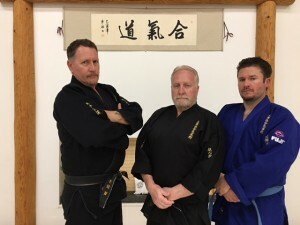 © 2019 Hidden Valley Aiki Kai.